During our family camping trip to Yosemite National Park a group of us did an early morning trail run. 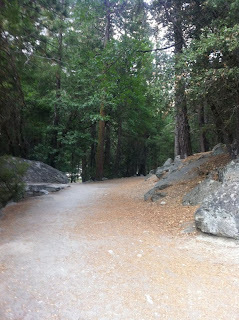 Since we were staying in Lower Pines campground in Yosemite Valley we began our run there and headed out towards Mirror Lake. We ran out of the campground and onto a main road running past Upper Pines Campground. 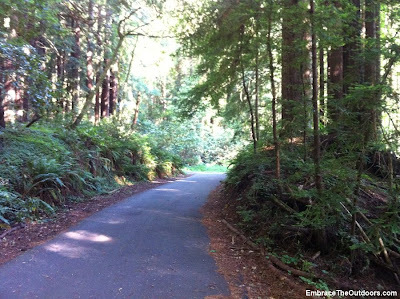 This road is used by park shuttle buses as well as pedestrians and bicycles to access the trailhead to Mirror Lake and makes a loop back to the campground. The loop also passes Happy Isles which has a nature center and is the entrypoint for hikes leaking up to Vernal Falls, Nevada Falls, Half Dome and other well known Yosemite destinations. Since it was early morning we didn't encounter any buses on the road. After just under half a mile we reached the trailhead for Mirror Lake. The trail here narrowed but was still paved. It was quiet and peaceful, it was nice to have the trail all to ourselves. We began to climb up here and continued to do so for a while. We started to feel the effects of running at over 4,000 feet. After about just over 1.5 miles we reached Mirror Lake. This body of water used to be much larger but it is really just a large pool now. 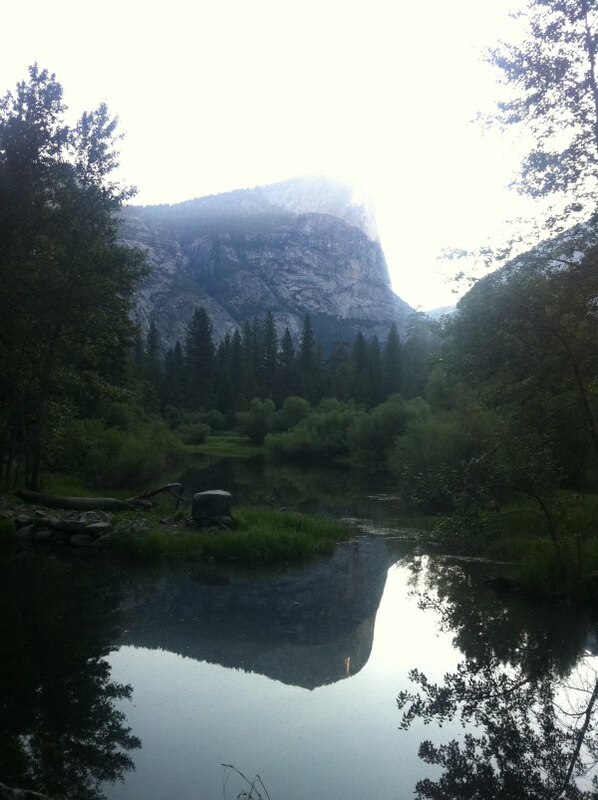 It is called Mirror Lake because in it you can see reflections of the surrounding cliffs. 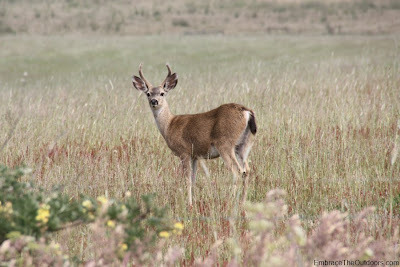 This area can be very crowded in the summer time but this early in the morning we had it all to ourselves to enjoy. 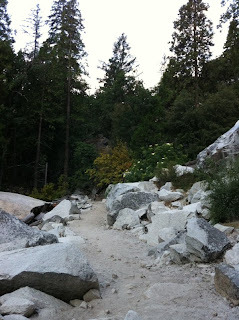 We continued past Mirror Lake onto Snow Creek Trail which was a rocky dirt trail. 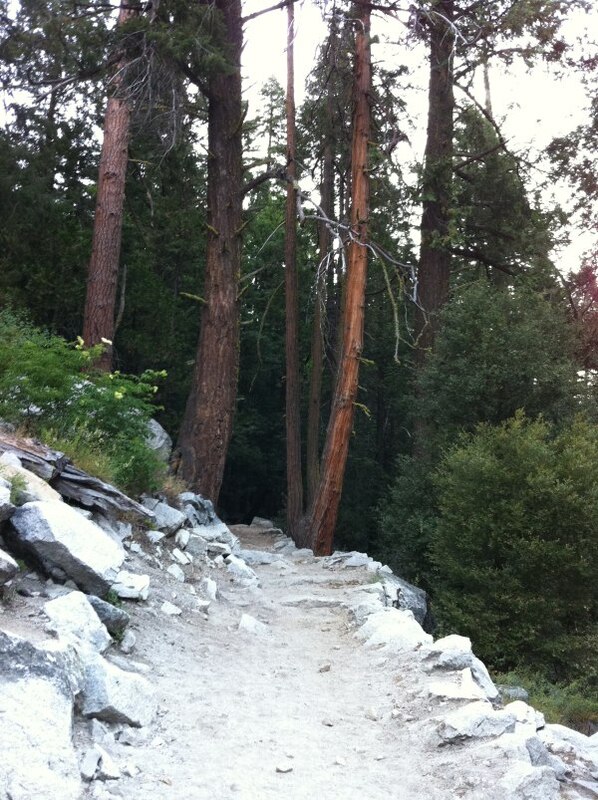 There were nice views of Half Dome from this trail. 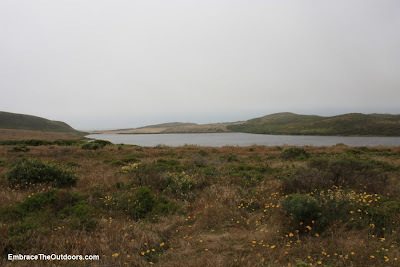 We turned back after we were just over 2 miles away from the campground and then retraced our steps back. 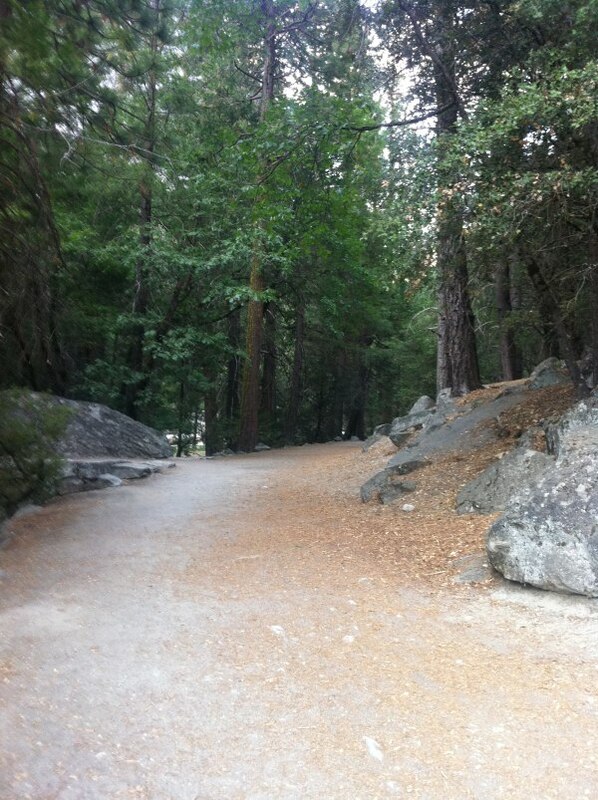 It was great being out for a run in beautiful Yosemite National Park on a beautiful morning. 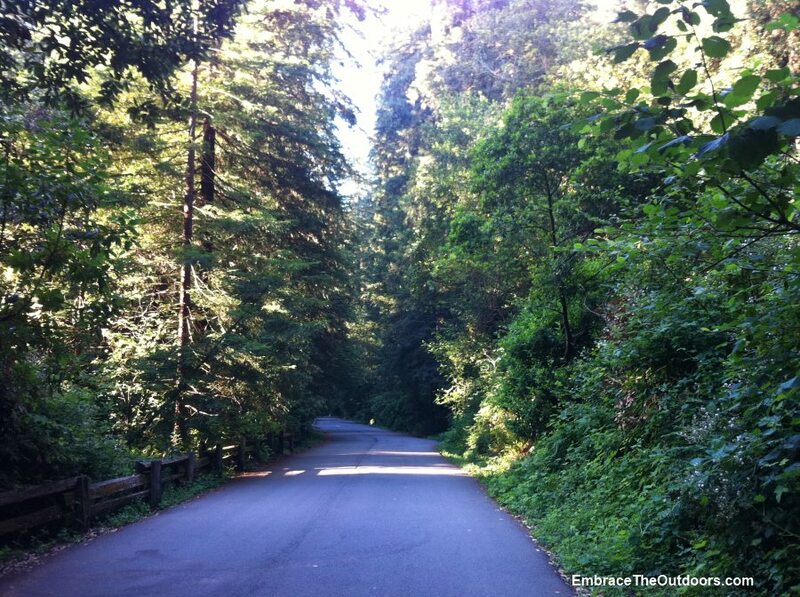 The trail was great for a run but I'm sure all runs in the park would be beautiful. I ran the Jailbreak 10k race in Dublin for the second year in a row. It takes place in Dublin near and around the Santa Rita jail and offers a 5k and kids run as well. 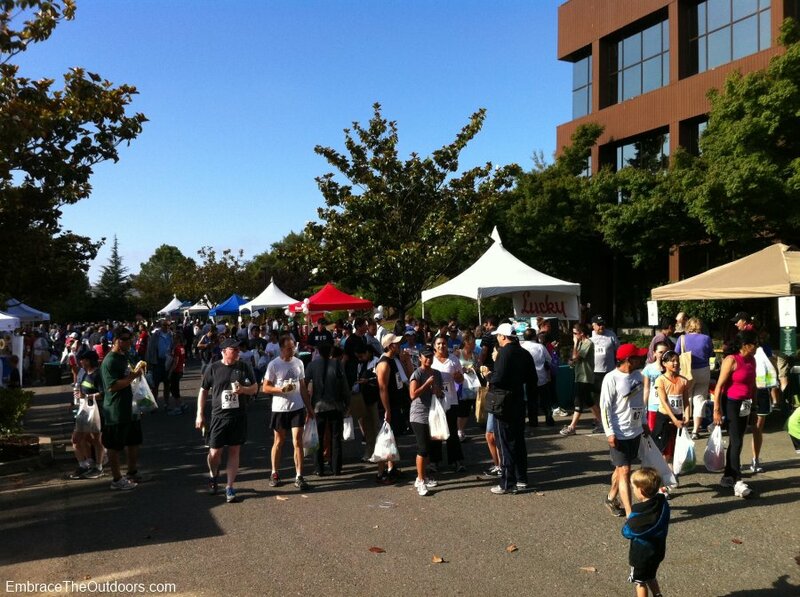 The event benefits a great cause, the Special Olympics of Northern California. The race fee was $30 pre-registration and $35 for race day registration and included a t-shirt and limited post race snacks. Parking was easily accessible in the large parking lot for the jail. From the parking lot it was a short uphill walk to the running track where bib and t-shirt pick-up was set up. There were waivers that had to be signed and turned in to pick up race bibs, even if you pre-registered. I hope that next year they can incorporate the waiver into the registration form so you don't have to do the waiver on race day. 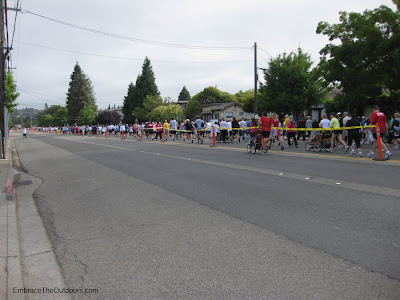 The lines for pre-registered runners were fairly short but the line for same day registration was longer. T-shirt pick up was next to bib pick-up and went smoothly. It wasn't until I had walked back down the hill to the race start area that I noticed my bib and those of the other participants were old leftover bibs from other races that had already taken place. I have to admit that I was thoroughly disappointed with this. I can't and still don't understand why there weren't bibs made for the current race, especially since there was no mention of this at the race. I was expecting there to be an announcement that there had been a problem with getting the bibs but nothing was ever said. Maybe this is trivial but combined with the fact that the company organizing the race does not offer timing chips I need to seriously reconsider whether or not to participate in their future races. Back to the race. The start was a mass start with both 5k and 10k participants starting at 8am. The SWAT team lead the start, running in formation but were quickly passed by several runners. 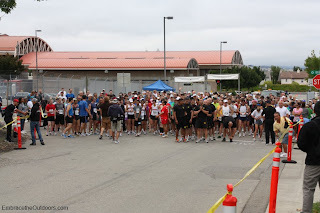 The route started by making a loop around the jail and just as we got back near the start area the route split the 5k and 10k runners. When I ran this race last year the split was not well delineated with no signs and just a person shouting out to the runners. Some people did not hear this person and followed the wrong route. This year there was again a person shouting out to runners but there was also signs making it clear that 10k runners were to go left and 5k runners to the right. 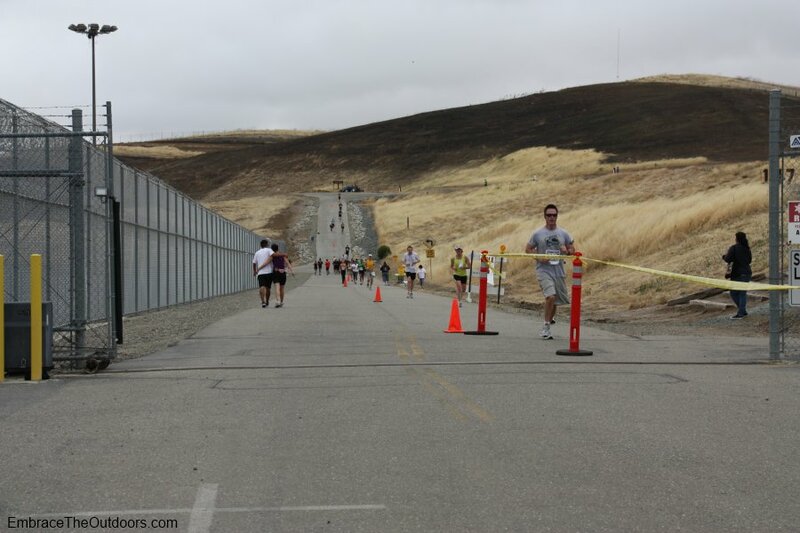 After this split the route for the 10k went north before going up a hill. This is the same hill that the SWAT team has to run in their training. 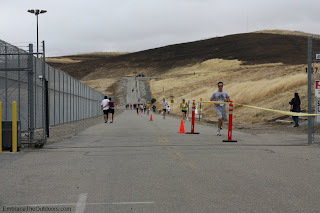 It wasn't too steep but it was an impressive hill that climbed over a mile to the water tower. The trail on the hill was completely exposed so the overcast weather was much welcomed. Once at the top I made my way around the water tower before heading back down the hill. Passing through the start again the route went near the training center before joining Tassajara Creek Trail. 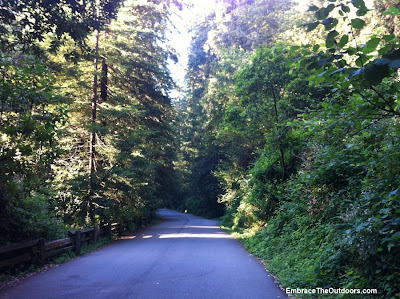 I followed this trail for about a mile or so before returning on the street through a residential area. The course in this area had some slight uphills and downhills with few flat sections. Heading back toward the start was the finish line, with the 10k chute to the left and the 5k chute to the right. There were several water stations along the course and mile markers at every mile. There were chalked arrows along most of the route to help guide the runners on the correct path. Plenty of bananas, orange slices and water were on the running track postrace. The kids races followed, then race awards. It was a good race course with good support but the race bibs and lack of timing chips was disappointing. We participated in the annual Eden Medical Center's Run to the Lake race for the first time this year. There was a 5k and a 10k. We ran the 5k. 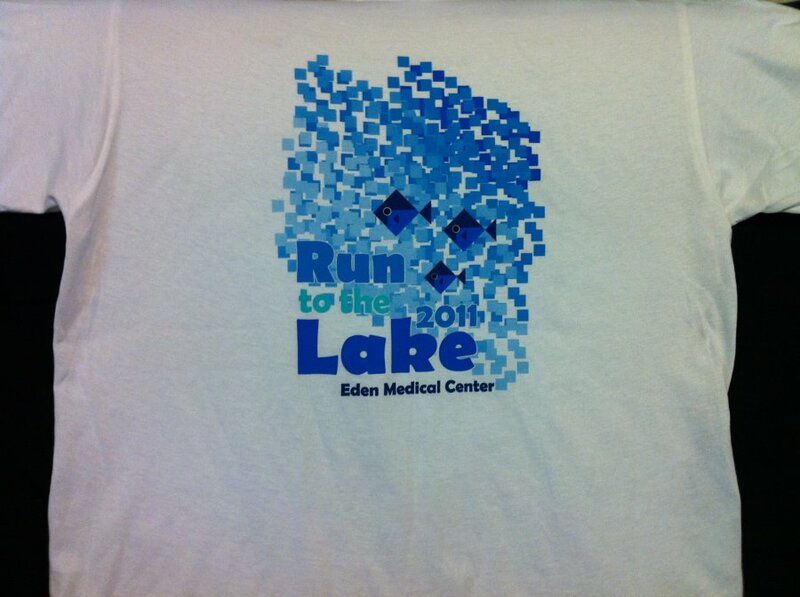 The race benefited the medical center's trauma center. 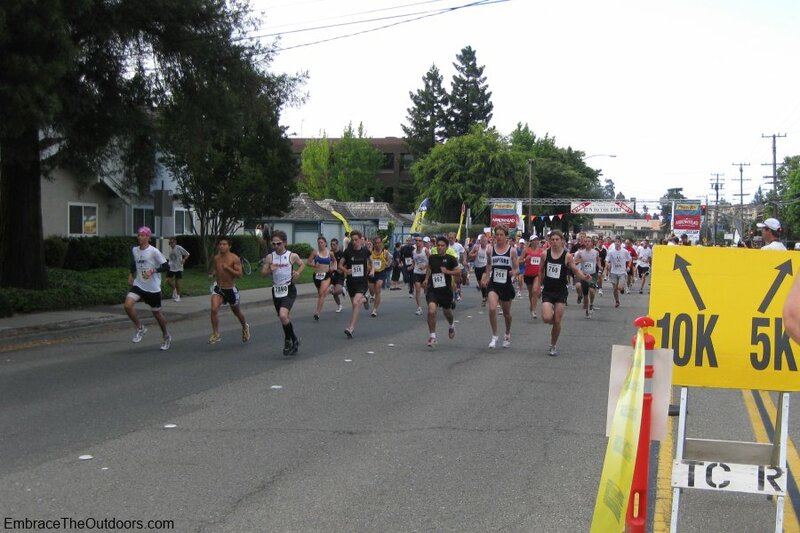 Entry fee was $25 for pre-registration and $30 for race day registration. 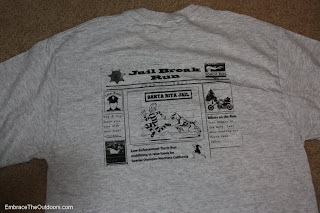 It included a cotton t-shirt, chip timing and post race goodies. Bibs and timing chips were mailed out to those that pre-registered. 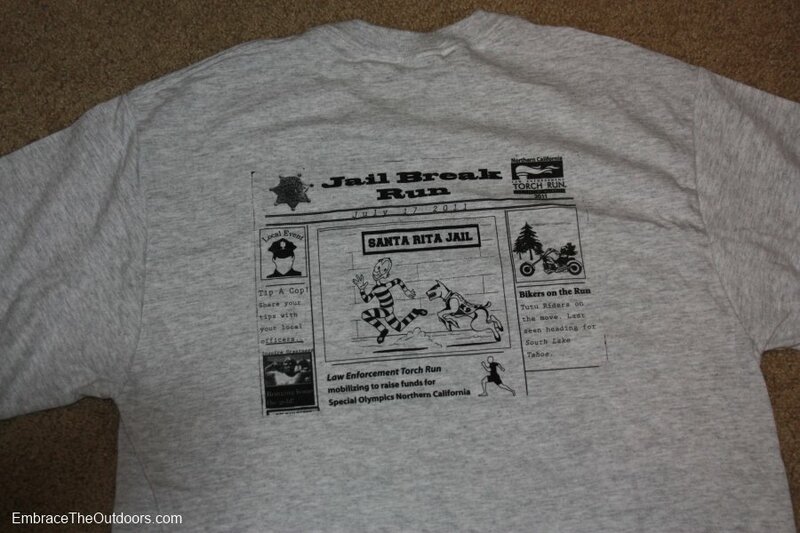 There was also an option to buy a Poly-Dri Wicking race shirt for $25. Parking for the race was plentiful in a nearby lot along with some street parking. 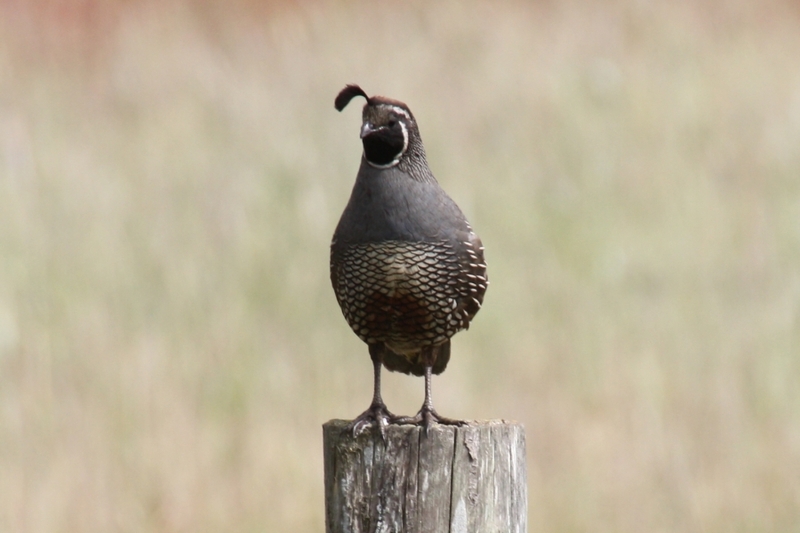 It took place on Lake Chabot Road in Castro Valley. The start was in front of Eden Medical Center and the course ran up Lake Chabot Road towards Lake Chabot Park. 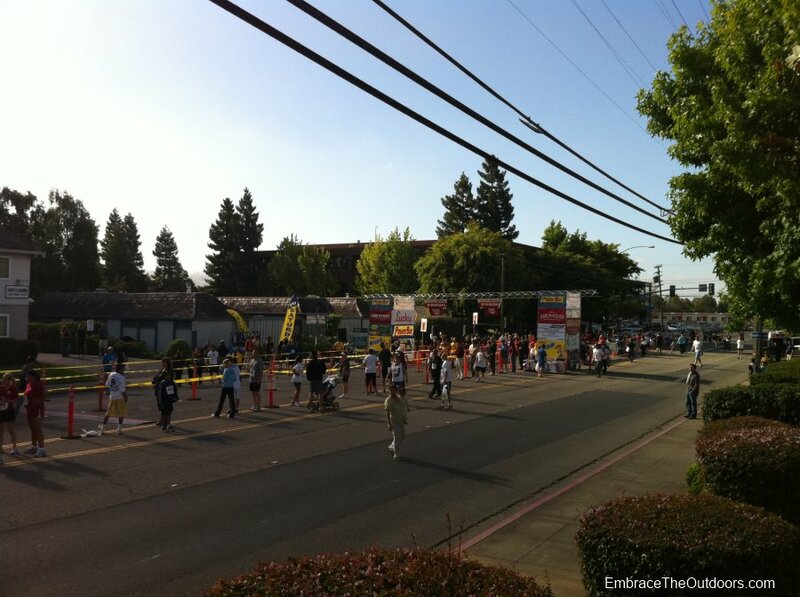 The 5k and 10k runners started together at 8am. The first half of the course was uphill but there were no street turns which was nice. There was a water station on the 5k course. Just as we got to Lake Chabot Park itself the 10k runners split off to do part of their race in the park while the rest of us continued on the main street for a short while before turning around. After the turn around we headed back on the same street towards the finish. After the finish it was just a short walk to water, fruit and chocolate milk. There were several booths set up for goodies for the over 1,000 race participants as well as those wanting to participate in the free Health Expo. Race results were to be posted early in the morning but there was a glitch with the timing system so we ended up leaving before they were posted and before race awards. Since there was such a delay in reporting results the timing company decided to mail awards to those that couldn't wait. Overall the race was well organized with lots of post race goodies. 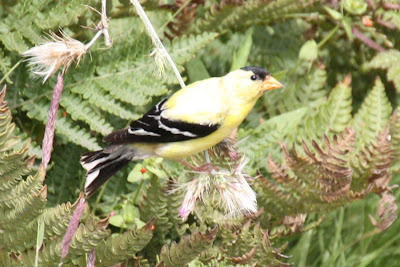 It was in a nice location with easy access to parking. We would definitely do it again. 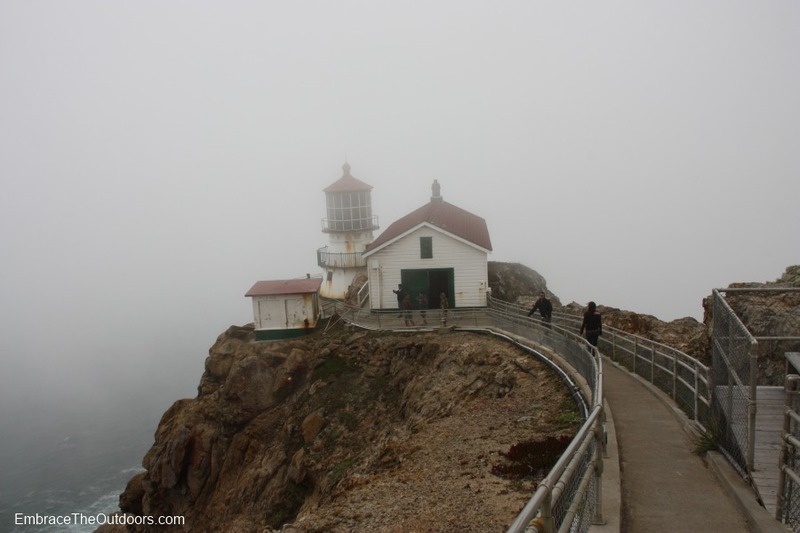 The Point Reyes Lighthouse, built in 1870, sits on the western most point of the Point Reyes Headlands. It's about a 45 minute drive from the Bear Valley visitor center at Point Reyes. 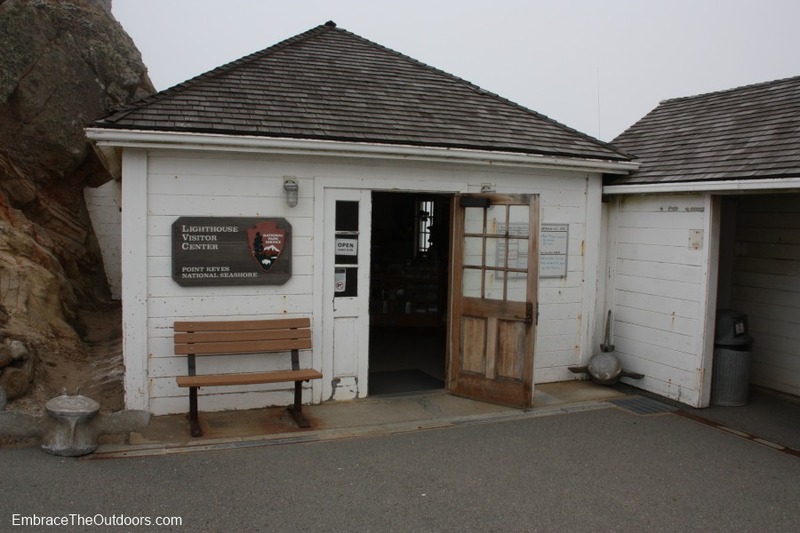 The lighthouse has its own small visitor center that is open Thursday through Monday 10am to 4:30pm. While spending the weekend near Point Reyes we made the drive to check out the lighthouse. There is a small parking lot at the end of Sir Francis Drake Boulevard. The parking lot was busy but we lucked out and got a spot. 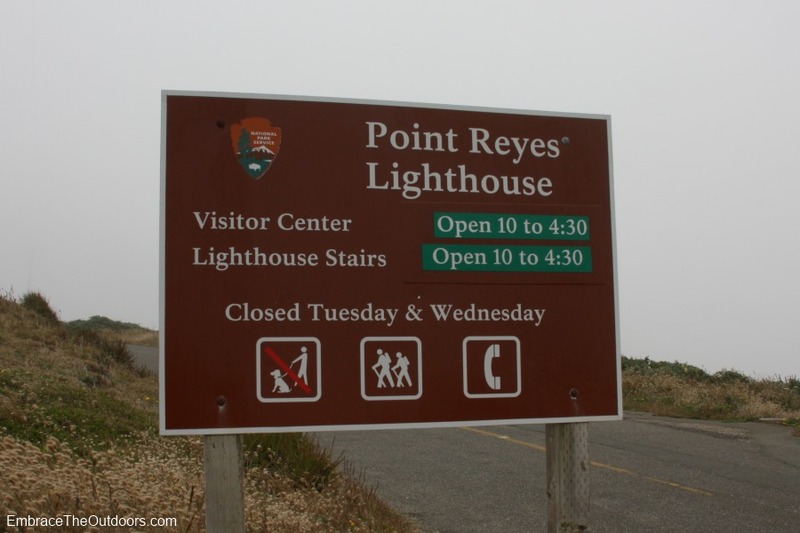 We made the half mile walk to the lighthouse visitor center. 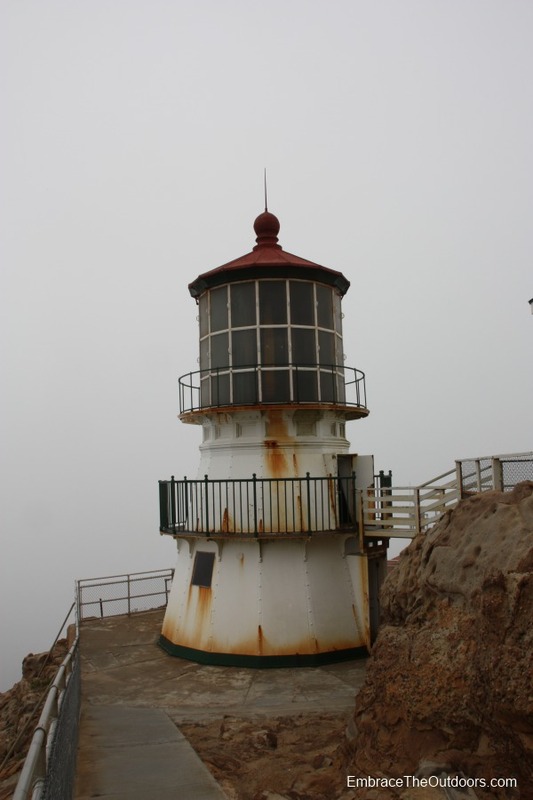 After a quick look inside we then proceeded down the 300 steps to reach the lighthouse itself. 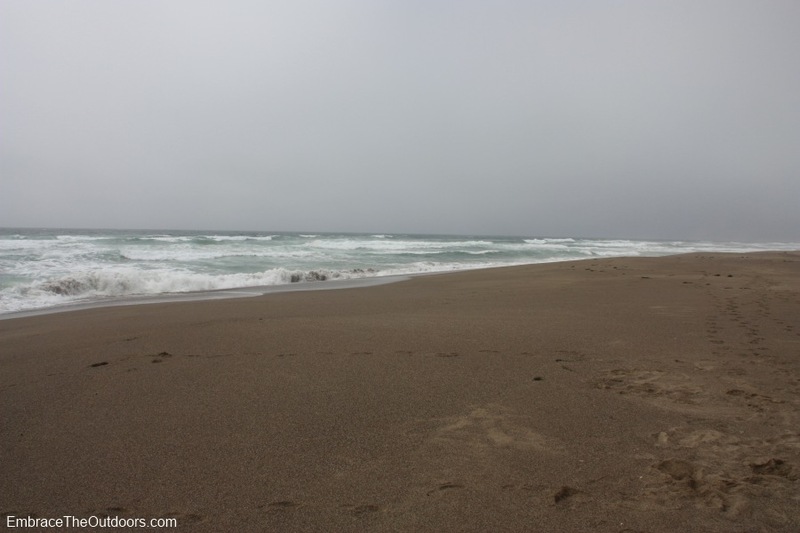 As it often is the fog was thick and the winds were gusting. 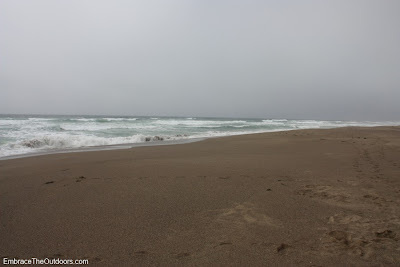 Point Reyes is supposed to be the windiest and second foggiest place on the North American Continent. We spent a little time walking around and then took a look inside the actual lighthouse. 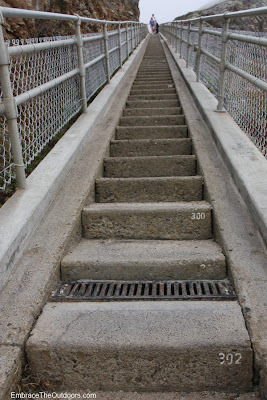 A few pictures and we headed back to those 300 steps. Going back up we noticed that the steps are numbered at 10 step intervals. We quickly proceeded up leaving us a bit out of breath when we reached the top. We took a quick break on a bench and made our way back to our car. 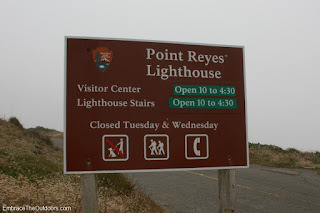 The lighthouse is interesting, you just have to make sure you leave enough time for the visit since it's a pretty long drive from everything else at Point Reyes. 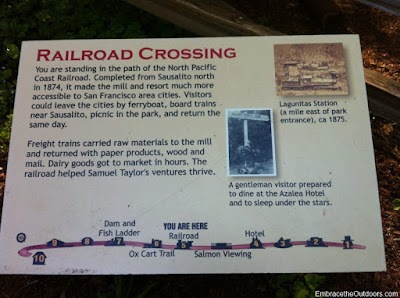 We have camped at Samuel Taylor State Park before and enjoyed it so we decided to stay there again with plans to do some nearby hikes. Samuel Taylor is almost 3000 acres in Marin County. 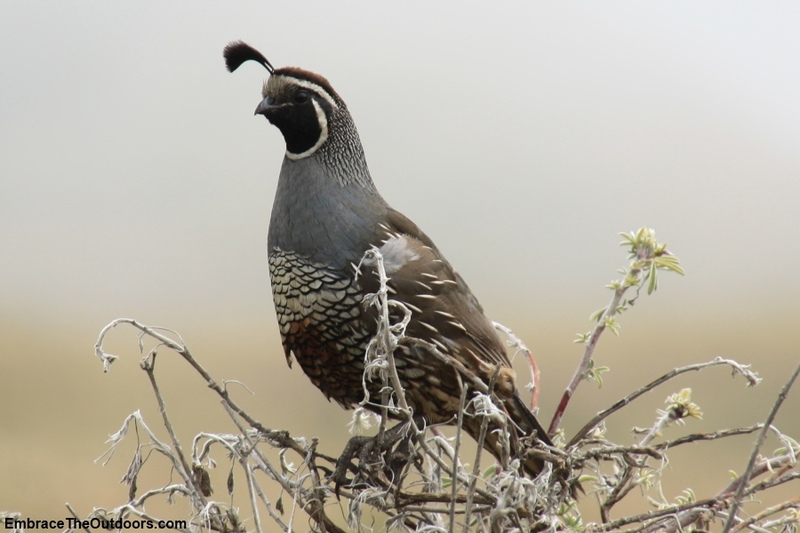 It is located on Sir Francis Drake Blvd between San Rafael and Olema. 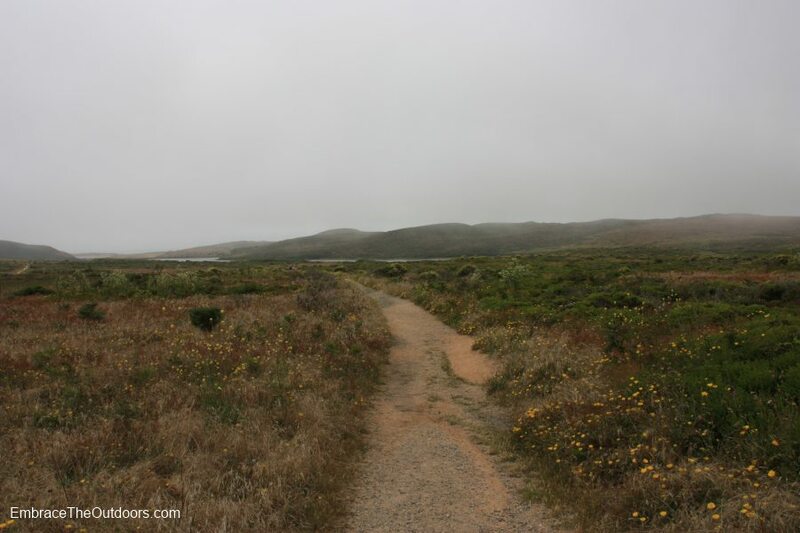 On this trip we had a chance to do a couple of nice morning runs on the Cross Marin Trail that runs through the park. 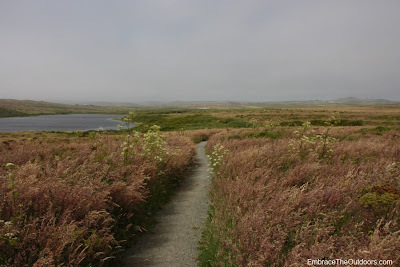 The Cross Marin Trail was once a railroad used by the Northwestern Pacific up until 1935. 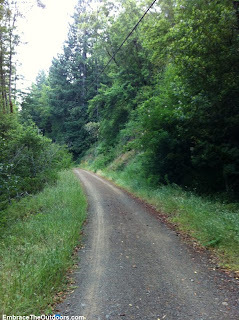 Today it is a path that runs parallel to Lagunitas Creek for 4.5 miles, three of which are paved. The other 1.5 miles is dirt and gravel. 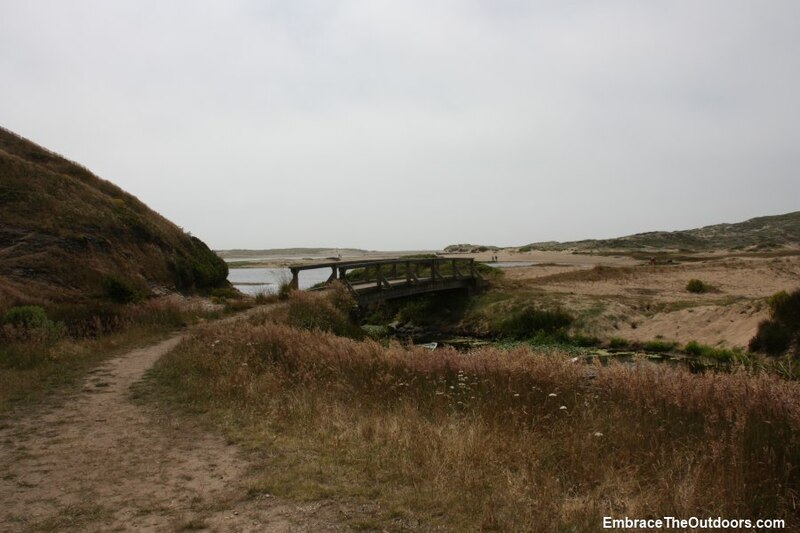 It's a multi-use trail used by walkers, bikers, runners and equestrians. 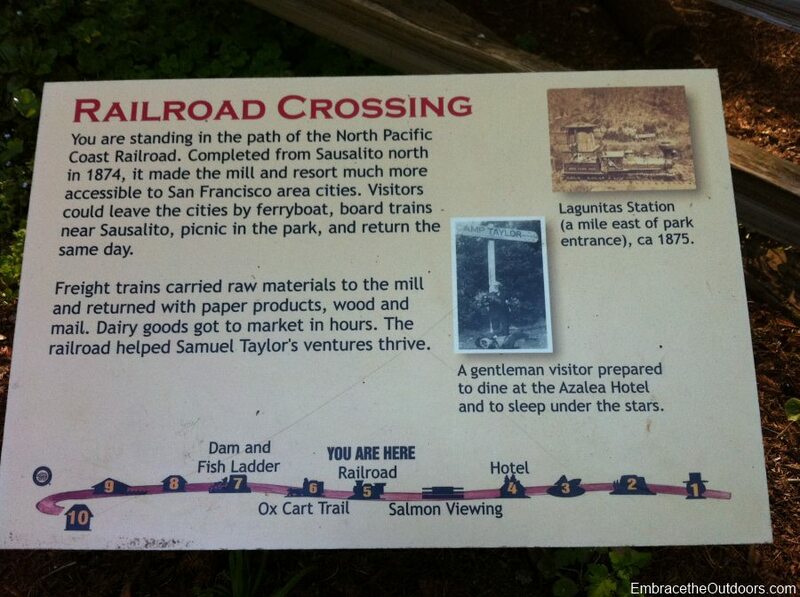 The trail crosses through Samuel Taylor State Park so we were able to walk to it from our campsite. On our first run we ran northwest on the trail, all of which was paved. 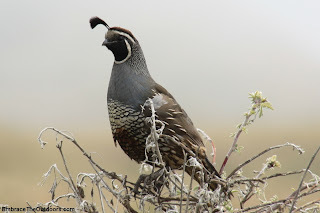 It was mostly shaded by trees and passed into the Golden Gate Recreation Area. We came across a few cyclists on the trail but the trail was not crowded by any means. We turned back before the end of the trail and headed back. Our second run took place in the morning as well but we headed east on the trail this time. It was paved at first and then dirt and gravel for the rest of our run. We crossed a few bridges and a couple of trail heads before heading back. Again the trail was not crowded, although with it being such a great trail we bet it can get crowded later in the day. 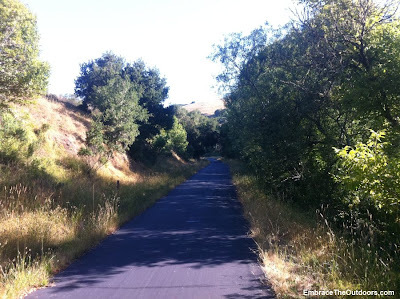 The fairly flat trail is great for walkers, runners, bikers. It's great for hikers too with several trails leading off from it, like the Pioneer Tree Trail and Devils Gulch Trail. 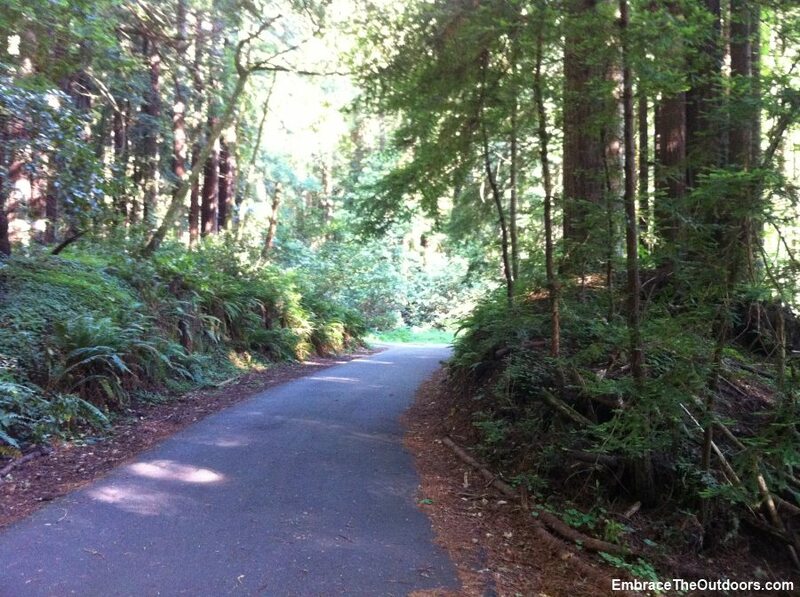 Its easy access from Samuel Taylor Park is great also, especially if you are camping there.